Determining how to assess draft trades in the NFL is not hard (see here, here, and here). Ever since Pro Football Reference went through the trouble of determining what average AV can be assigned to a draft slot, it’s merely a matter of counting. The technique has some variance, as the draft slot of a future pick is not known. Even so, with a bit of conservative extrapolation, you can still get a feel for the overall cost of a trade. The AV costs of the 2016 Rams Titans trade. In the data above, we assume that the Rams will improve 5 slots in draft placement, so that the first and third they sent to the Titans would be picks 20 and 84. If the Titans end up 18th or 23rd, it’s notable that the difference in value at this point is less than the point-to-point deviation, so that kind of change won’t affect the calculation much. Pro Football Reference’s raw data are moderately noisy. The Rams total investment is 136 AV, roughly equal to the career value of John Elway. That’s not entirely accurate, as the Rams actually received three picks in return, and if the other two return 19, then the player they pick at #1, to return the value of the investment, only has to yield 117 AV.Now, 117 points is about mid in between Phillip Rivers and Aaron Rogers in value. Update: Johnny Unitas, at 114, is a closer comparable. In terms of risk, the trade is riskier than the Eli Manning trade, and less risky than the RG III trade or the Earl Campbell trade. For 9 more AV than the RG III trade, they received 24 more AV in return. Best of luck to the Rams. I hope their picks work out well for them. The break even points on the Eli Manning and Robert Griffin III trades. In my last post, I introduced ways to determine the risk of NFL trades, using Pro Football Reference’s average AV per draft slot metric to assess the relative risk of the trade. I wish to continue the work done in the first post, by also taking a look at the Eli Manning trades, and also the Robert Griffin III trades. Eli's debt will be paid off in 2 more years of his current level of play. RG3 will have to have a Sonny Jurgenson-like career, all in Washington, to pay off the value of the picks used to select him. In the Eli trade, the New York Giants assumed a ‘AV debt’ comparable to that of Michael Vick, and a relative risk approximately the same as Michael Vick or Julio Jones. Looking, Eli has rolled up perhaps 87 AV at this point, netting 12-15 AV a year. So, in two years, in purely AV terms, this trade would be even. Please note that NFL championships appear to not net any AV, so if the value of the trade is measured in championships instead, I’d assume the New York Giants would consider themselves the outright winners of this trade. The appropriate comparison with the Robert Griffin III trade is actually the Earl Campbell trade. The risk ratio is about the same, assuming the Washington Redskins go 8-8 and 9-7 the next two years, and end up with the #16 pick in 2013, and the #20 pick in 2014. 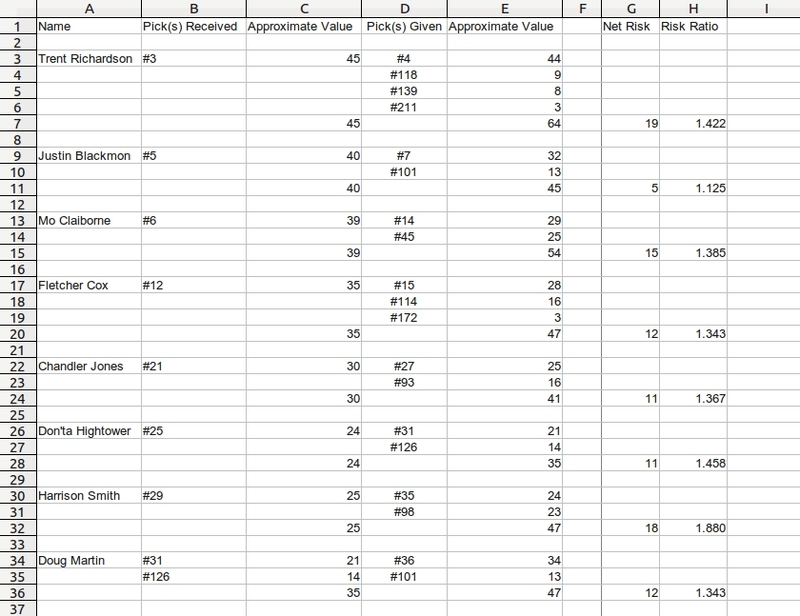 The lowest value the AV Given column could total is 106, if the Washington Redskins ended up with the #31 pick twice. In any event, the Redskins are betting that RG3 will have a Sonny Jurgenson-esque career, and not just his Washington Redskin career, but his Eagles and Redskins career, in order to pay back the ‘AV debt’ that has been accrued by this trade. There were eight trades in the first day involving the first round of the 2012 NFL draft. Most of them involved small shifts in the primary pick, with third day picks added as additional compensation. The one outlying trade was that of the St Louis Rams and the Dallas Cowboys, which involved a substantial shift in the #1 pick (from 6 to 14) and the secondary compensation was substantial. This high secondary compensation has led to criticism of the trade, most notably by Dan Graziano, whose argument, boiled to its essence, is that Dallas paid a 2 pick price for Morris Claiborne. Counting picks is a lousy method to judge trades. After all, Dallas paid a 4 pick price for Tony Dorsett. Was that trade twice as bad a trade as the Morris Claiborne trade? The Fletcher Cox trade saw Philadelphia give up 3 picks for Fletcher Cox. Was that trade 50% worse than the Morris Claiborne trade? In order to deal with the issues raised above, I will introduce a new analytic metric for analyzing trade risk, the risk ratio, which is the sum of the AV values of the picks given, divided by the sum of the AV values of the picks received. For trades with a ratio of 1.0 or less, there is no risk at all. For trades with ratios approaching 2 or so, there is substantial risk. We are now aided in this kind of analysis by Pro Football Reference’s new average AV per draft pick chart. This is a superior tool to their old logarithmic fit, because while the data may be noisy, they avoid systematically overestimating the value of first round picks. 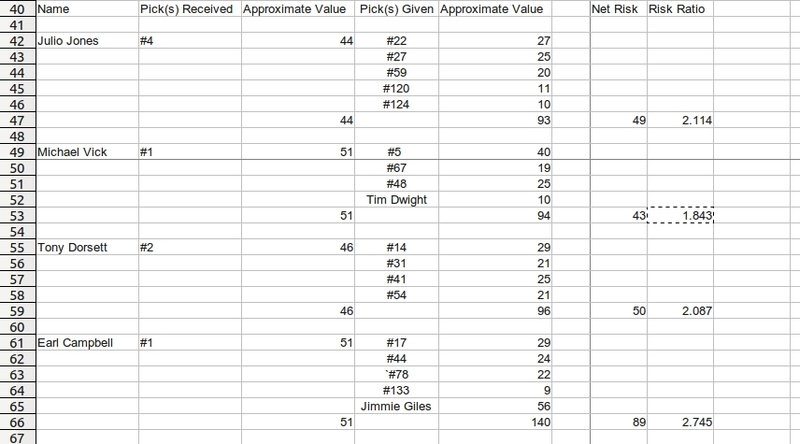 The eight first round trades of 2012, interpreted in terms of AV risk ratios. The first thing to note about the 8 trades is that the risk ratio of 6 of them is approximately the same. There really is no difference, practically speaking, in the relative risk of the Trent Richardson trade, or the Morris Claiborne trade, or the Fletcher Cox trade. Of the two remaining trades, the Justin Blackmon trade was relatively risk free. Jacksonville assumed an extra value burden of 10% for moving up to draft the wide receiver. The other outlier, Harrison Smith, can be explained largely by the noisy data set and an unexpectedly high value of AV for draft pick 98. If you compensate by using 13 instead of 23 for pick #98, you get a risk ratio of approximately 1.48, more in line with the rest of the data sets. Armed with this information, and picking on Morris Claiborne, how good does he have to be for this trade to be break even? Well, if his career nets 54 AV, then the trade breaks even. If he has a HOF career (AV > 100), then Dallas wins big. The same applies to Trent Richardson. For the trade to break even, Trent has to net at least 64 AV throughout his career. Figuring out how much AV Doug Martin has to average is a little more complicated, since there were multiple picks on both sides, but Doug would carry his own weight if he gets 21*1.34 ≈ 28 AV. Four historic trades and their associated risk ratios. By historic measures, none of the 2012 first round trades were particularly risky. Looking at some trades that have played out in the past, and one that is still playing out, the diagram above shows the picks traded for Julio Jones, for Michael Vick, for Tony Dorsett, and also for Earl Campbell. The Julio Jones trade has yet to play out, but Atlanta, more or less, assumed as much risk (93 AV) as they did for Michael Vick (94 AV), except for a #4 pick and a wide receiver. And although Michael is over 90 AV now, counting AV earned in Atlanta and Philadelphia, he didn’t earn the 90+ AV necessary to balance out the trade while in Atlanta. Tony Dorsett, with his HOF career, paid off the 96 AV burden created by trading a 1st and three 2nd round choices for the #2 pick. Once again, the risk was high, the burden was considerable, but it gave value to Dallas in the end. Perhaps the most interesting comparison is the assessment of the Earl Campbell trade. Just by the numbers, it was a bust. Jimmie Giles, the tight end that was part of the trade, had a long and respectable career with Tampa Bay. That, along with the draft picks, set a bar so high that only the Ray Lewis’s of the world could possibly reach. And while Campbell was a top performer, his period of peak performance was short, perhaps 4 years. That said, I still wonder if Houston would still make the trade, if somehow someone could go back in to the past, with the understanding of what would happen into the relative future. Campbell’s peak was pretty phenomenal, and not entirely encompassed by a mere AV score. About as soon as Dallas lost their last game of the season, a veritable consensus formed in fan circles about what Dallas should do: almost any fan mocker worth his salt had Dallas picking up Carl Nicks in free agency and drafting David DeCastro in the 14th. That this quinella might be hard to pull off didn’t faze the crowd, and arguing with any of these guys an amazing waste of time. I felt as if I was looking at the daily barrage of “Patrick Peterson falls to the Boys” exuberance all over again. As @FO_MTanier has noted on Twitter, this interest in DeCastro spills over into the media as well. It’s taken perhaps a month, but those fans that claim “insider” connections, and are respected in general for, perhaps, actually having those connections are saying now that the Boys are more looking for a center in free agency and will let the guards they have develop. Costa is regarded as the weak link, not the collection of talent at guard. Further, Steven Jones has said that the defense needs work, and media/fan draft interest is beginning to shift to others, people such as Melvin Ingram, Luke Kuechly and Dontari Poe. Is this man a future Redskin? Image from Ceasarscott of Wikimedia. The recent combine workout, including a 4.38 40 times of Robert Griffin III has changed the fan status of RG3 in the eyes of Redskins fans to something approaching blowtorch heat. It hasn’t been mellowed by Saint Louis openly shopping the second pick. The first pick is pretty much assumed to be Oliver Luck, but a fella with a cannon arm, clear intelligence and Vick-like speed leads people more and more to think that Mr. Griffin will be, at worst, a poor man’s Vick. And if he’s more judicious with his throws than Michael, learns the game more intimately, well then all the better. There is now the smell of potential top 10 QB around RG3. Four teams are thought to be interested in Robert Griffin: Cleveland, Washington, Miami, and Seattle. How much of that is real, how much of that is assumed, I can’t tell presently. Talk radio has Cleveland in the driver’s seat for a trade, as it has 2 number 1 picks, and the #4 pick as well. The Skins, by contrast, have only the #6 pick. A #2 pick is worth 2600 points on the JJ chart. Cleveland’s #4 is worth 1800, and their #22 pick is worth 780, about even in value. That said, Peter King is making comparisons to the trade for Ryan Leaf, which netted 2 firsts, a second, and Eric Metcalf. Already, in Redskins fan circles, people are saying they wouldn’t pay 3 #1s for RG3, but if the Leaf trade sets the benchmark, I’d suggest that the equivalent of three #1 choices is the going rate for a potential top 10 QB. The Redskin’s first round choice is worth 1600 points. How do they make up 1000 points without at least giving up another #1? Beyond that, what sweetener could they give that would make their trade better than Cleveland’s two #1s? NFP’s take on Dallas team needs. NFP’s take on Redskin team needs. NFP’s take on Eagles team needs. NFP’s take on Giants’ team needs.